I was delighted to find out that I make someone's day! I got the You Make My Day award from Mirka (Oprikka) and Danielle (of paper & thread). Thank you both so much! 1. Write a post with links to 5 blogs (or 10 according to some) that make your day. I try to give this award to blogs that don't already have a bunch of this particular award. Spread the love. And this is what Deanna sent me (remember the PIF?)! 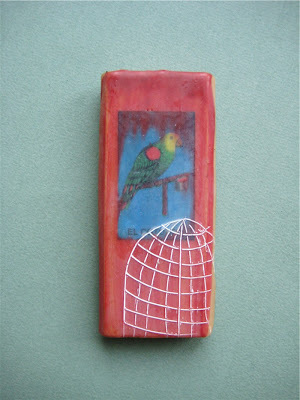 A small and lovely encaustic painting! I'm so Finnish that almost all colorful birds are parrots to me, and it happens to be so that a parrot is papukaija in Finnish. Ha, a bean Kaija, because papu is bean. (I have no idea why papukaija is what it is.) I've been hearing a lot of parrot jokes throughout my life, and this was probably the first time I was really happy because of the name coincidence! I'm making progress with the book, but there's still a whole lot of work to do. I think I can finish it in time. In fact I'm so sure about finishing it that I feel like taking a little break... Bad idea. Now I need to get back to work.